Today was the day! James Scott Powers, age 8, from San Angelo, Texas, still couldn't believe he had been lucky enough to win the big soccer sweepstakes. The grand prize had been tickets to watch his favorite team the San Angelo Raiders at the stadium. Jamie was especially excited because as the big winner he was going to get to sit on the bench with Joe Nichols and Steve Wright! Also, Jamie could take Garrett, Tevin and Ty to the game, too. Once inside the stadium, Jamie, Garrett, Tevin, and Ty were ushered to the San Angelo Raiders locker room. "Jamie, you're such a big fan of ours that we'd like to make you an honorary member of the San Angelo Raiders," the coach said. "Here's your very own uniform." The coach then turned to the players. "Okay everybody, let's win this one for Jamie!" The team all cheered and ran out to the field. Jamie, Garrett, Tevin, and Ty hurried to their seats on the bench. They didn't want to miss the opening kick off. As they sat down, the referee tossed the coin. The San Angelo Raiders won the coin toss, and decided that they would kick off. The ball was kicked into play. The players dribbled the ball down the field. Jamie watched excitedly as the ball went up and down the field. His team kept making runs at the goal but hadn't been able to score yet. The opposing team was the Abilene Stars and they had already scored once. Suddenly, Jamie heard a whistle. One of the San Angelo Raiders had been fouled by the other team and was lying on the ground clutching his leg. With all the excitement on the field, no one noticed that the ball was zooming through the air right towards Jamie. What could he do? Thinking fast, Jamie gave the ball a mighty kick. Up, up in the air the ball went. "That was quite a kick," the coach said to Jamie. "We have an injured player and the team needs a player to kick the free kick. Have you ever kicked a free kick before Jamie?" "Sure! I love playing soccer! I know I can score on the free kick for you," Jamie said. Jamiecould not believe his good luck. He was actually going to get a chance to help the San Angelo Raiders win the game! Dwayne DeRosario, Ronnie Ekelund and Zak Ibsen walked up and said, "Glad you are going to try our free kick, Jamie. We know you can score." Jamie lined up in front of the goal to kick the ball. The coach yelled, "I know you can do it, Jamie!" Jamie looked at the soccerball lying on the field. With all his might, he kicked the ball straight at the goal. The goalie from the Abilene Stars jumped towards the ball as it flew through the air. 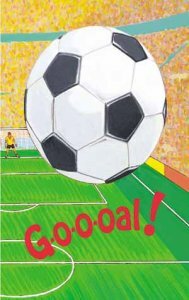 The soccerball sailed by the goalie's hands and into the net. Now the score was tied, but Jamie wanted the San Angelo Raiders to win. Jamie used all his soccer skills. He dribbled the ball down the field. He trapped the ball with the top of his foot. He even used his head to pass. "Way to go Jamie," yelled the coach from the sidelines. "That was a great header!" Jamie kept looking for the shot but hadn't scored another goal. There was less than a minute left in the game and Jamie was getting tired, but he couldn't disappoint his team. The ball came towards Jamie but he was far from the goal. Suddenly, he saw an opening. "Do I really have the shot?" wondered Jamie. There was only one way to find out. Jamie used all his strength and tried a long kick. The crowd grew silent as the ball flashed through the air. The ball hit the edge of the goal for just a second, then bounced into the net. Score! Jamie had scored the winning goal! The San Angelo Raiders had won the game! The crowd started chanting, "Jamie, Jamie!" The other players hoisted Jamie above their shoulders and marched him around the field. "This has to be the best day of my life," Jamie said to Garrett, Tevin, and Ty. As the coach handed Jamie the Most Valuable Player trophy, he said, "Jamie, you can play on our team any day. You're a real soccer superstar!"